Why are urban schools on the rise? So, there was evidence given yesterday that urban, city, downtown schools are getting better. – The No Child Left Behind Act that revealed the achievement gap among ethnic groups, resulting in educators getting much more serious about teaching minorities. I think a new generation of parents should be given way more credit than this. Parents and parents-to-be-but-don’t-know-it-yet who embrace the diversity, community and culture of downtowns will invest in it, which is why you see the renaissance of so many downtowns (and exorbitant prices as a result.) They are also fully immersed in the internet economy, and find it easier to participate in what’s thus increasingly becoming a customer-driven economy. The result is more charter schools, involved and connected parents, and dollars for urban schools, as well as a greater diversity of students and freshly-designed classrooms that rival the spirit-lifting lofts and open workplaces found in cities. It may not be surprising, given the assets, that the best schools in the nation will soon be in the cities. 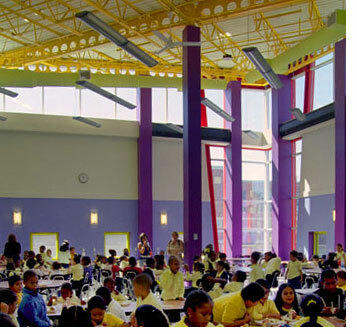 Image: The Orchard Gardens K-8 Pilot School in Boston, MA.